Cape Daisy (Osteospermum spp. ): growing, planting, caring. A half-hardy perennial with daisy-like flowers from spring to the autumn. Scientific name : Osteospermum spp. 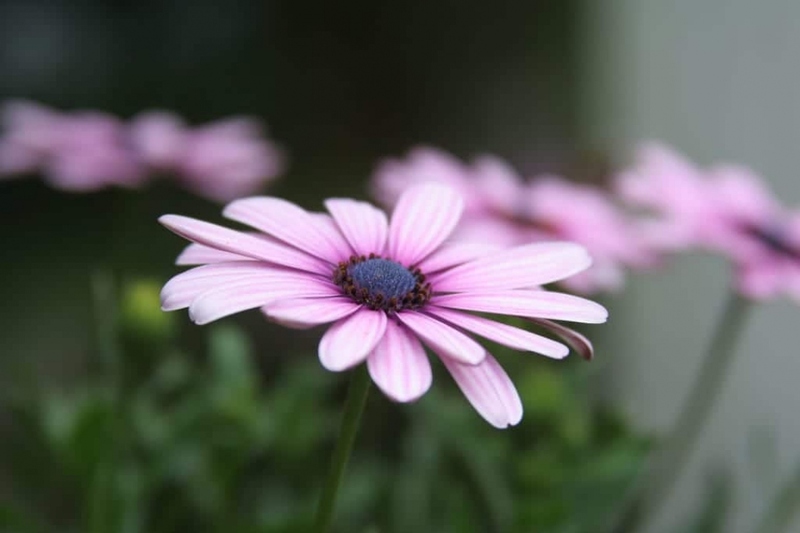 Osteospermum - Cape Daisy, Daisybush or African daisy - is a genus of flowering plants belonging to the Calenduleae, one of the tribes of the very large daisy family Asteraceae. There are about 80 species, native to Africa and southern Africa. They are half-hardy perennials or subshrubs, with alternate, but sometimes opposite, lanceolate green or variegated leaves and daisy-like flowers in several colors such as blue, yellow and purple. They are popular in summer bedding and numerous hybrids and cultivars have been produced with a wide range of tropical colors. Daisybushes, Dimorphoteca or African daisy looks a bit like large daisies. It has the hability to close its flowers in the evening, and even when the light falls. The flowers usually carried by solitary stems exist in multiple colors: the velvety petals are white, pink, purple, lavender blue, terra cotta, orange, salmon, etc. ; the core is yellow, orange, bluish or almost black and contrasts sharply with the bright yellow stamens. The back of the petals always has a different color, more sustained or on the contrary lighter. The foliage is less decorative: the leaves with very short petioles are bright green, slightly hairy, lanceolate, simple or cut into several lobes with pointed ends depending on the variety and their arrangement on the plant. They form a compact tuft that can measure 0.30 to 0.60 m in height and the same in width. In open soil or in pot? It's simple, if the temperature drops permanently below 5 ° C outside, it will be in pot! Plant in the spring. Daisybushes needs a well-sheltered, sunny, and well-drained soil as it dreads when its roots stagnate in the water. If you keep it in a pot, use a terracotta container that is well adapted to its size. In open soil, choose a sufficiently sunny location, it is the guarantee of a beautiful flowering. Respect a spacing between the plants equal to one-third of their intended width. Water copiously to facilitate rooting and recovery. Daisybushes dreads excess water! In pots ouside, water in case of lack of prolonged rain, and the winter, indoors, once a month should suffice. In open soil, watering is not necessary, except during intense drought. No mulching in summer for osteospermum, which seems not to appreciate it. No fertilizer either. Simple to cultivate, we said! In March, before the vegetation regrows, prune the osteospermum with shears to restore its compact, globally spherical shape. You will also have to to remove, between the thumb and forefinger or with a pruner, the faded flowers 2 to 3 times a week. Courage! Daisybushes will not survive a winter outside! If your plant is in a pot and you got a sheltered place with enough light, at a minimum temperature of 10 ° C, then bring your plant in before the first freezes. Water slightly during the winter. You should take it out again in May. In May, well after the last frosts, take out your potted plants to find them a spot sheltered from the wind and sunny!